The doTERRA Essential Oil Chemistry Wheel is a tool designed to help you better understand the chemistry behind essential oils so you can more fully understand when and how to use the oils to achieve a desired benefit. The doTERRA Oil Chemistry Wheel has now been expanded into two wheels, each with two sides. 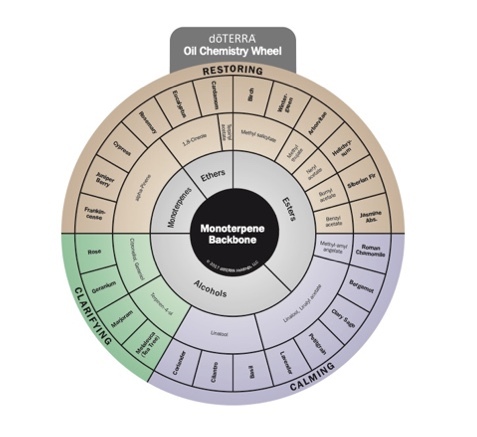 The first wheel gives information on oils high in monoterpenes (oils that have a 10-carbon backbone). The monoterpene side of the wheel describes oils with lifting properties, and the other side presents oils with leveling properties. The second wheel contains information about oils high in sesquiterpenes (oils that have a 15-carbon backbone) on one side, with a legend on the opposite side. In each of the chemistry wheels, the oils are further organized by functional group, with the top one or two chemical constituents listed under each oil. The oils in the doTERRA Chemistry Wheel are grouped according to their shared key properties. The shared key properties provide a starting point for understanding how to use the oils. The combination of these different groupings enables individuals to begin to understand the characteristics and properties of doTERRA’s amazing essential oils.